sassy two socks: I'm no zombie hater! 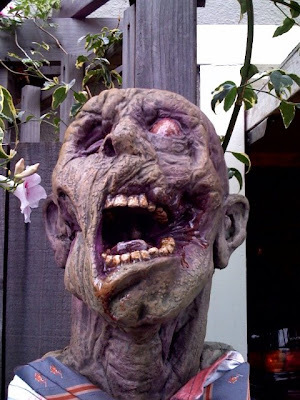 Did you know that actual life-size zombies are for sale? Well, I guess you're not surprised since anything can be bought on the Web these days. 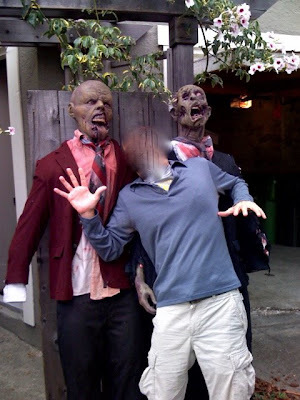 But did you ever think you'd know someone who would actually pay money to own not one, but TWO, life-size zombies?!?! My future-bro-in-law is one of those freaks (luv ya, bro!). 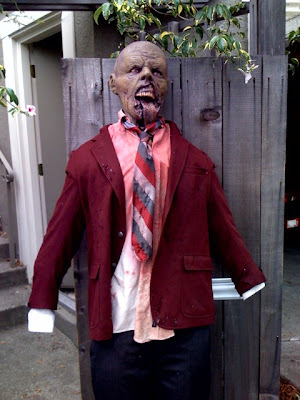 Him and his friends combined funds to purchase two of these zombie dolls for a movie that they are "producing". I've seen the trailer, though it's in the early edit stages, and I hope someday to be able to share it with you all, here on STS! Perhaps he'll give me exclusive rights to premier his trailer! That would be rad. This one, above, is actually Mr. T doing his best scaredy face. But I accidentally made his head look like it's vanished. This is by far my worst Photoshop job ever, because it looks like my FBIL's head is missing a chunk. Maybe because it's in one of the zombie's mouths!!!! Go ahead, buy one, I dare you. So, despite the fact that my future-bro-in-law is a dead puppy lover, I love him. Because he always gives me good material for my blog. 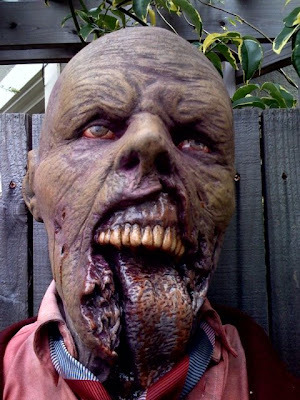 Why didn't they just buy Zombie masks? I scrolled down the page slowly to fight quite the frightening photos. Damn, those are some freaky zombies. Can you imagine the kind of pranks that you can pull off! What do the faces feel like? Are they soft? Gooey like? Why do I need to know... I don't even know myself... but I feel like I HAVE to know! pop-ups are evil... and psychic? damn you google and your ninjas! what about venti soy triple mocha? i can has two socks?! Tonks shat on her dad!! We've got an award! WHAT?! My kitten gave me a hickey?!?! Why is watching people eat it so much fun? I believe. More than ever. Cute kitty or fruit bat? Sarcasm: Evil or Playfully Ambiguous?